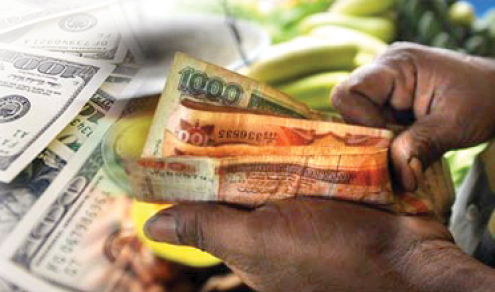 The exchange rate (ER) sank to its second lowest ever value in its retail selling price by commercial banks in Colombo yesterday, egged on by expectations that the Federal Reserve System (Fed. ), for the first time this year, will hike its key policy rate when they meet in December, i e, after the November US presidential election. This has resulted in foreign funds fleeing local financial markets in favour of US based assets, thereby causing downward pressure on the ER. As a result, the ER edged closer to the Rs 150 level, declining sharply by 29 Sri Lanka cents to Rs 149.69 to the US dollar in commercial banks' average selling rate in Colombo for Telegraphic Transfers (TT) at 9:30 a.m. yesterday (compared with Thursday's close), according to Central Bank of Sri Lanka (CBSL). The lowest the ER has fallen is Rs 150.54 which was on 30 March, 2016. In the calendar year to date, the ER has declined by 2.40% (Rs 3.51) to the dollar in commercial banks' average rates in Colombo for TT, having closed last year at Rs 146.18, according to CBSL. A Bloomberg report of Thursday said that the market has priced a 72% chance of the Fed, raising rates at its December meeting. The Fed last December, for the first time after nine years, raised its policy rate, known as the Fed Funds Rate (FFR), which previously had been brought down to zero levels at the height of the global financial crisis in 2008. But due to the recovery of the world's largest economy, the Fed in its policy setting meeting last December raised the FFR by 25 basis points (bps) to be currently in the range of 25-50 bps. Meanwhile, in May 2013, when then Fed Chairman Ben Bernanke said that the Fed would begin scaling down on its bond buying programme amounting to some US$ 85 billion a month (bigger than Sri Lanka's economy estimated at $ 82.3 billion last year) at that time, beginning September 2013. That resulted, in the intervening months, in foreigners exiting the local Treasury (T) Bill and T-Bond market, causing depreciative pressure on the rupee, similar to that which is now taking place, 3½ years later. As Sri Lanka is an import- dependent economy, a weak rupee will make the prices of essentials rise, hitting the poor and the fixed wage earner the hardest. Further, when it comes to the Government of Sri Lanka's (GoSL's) foreign debt servicing requirements, the necessary dollars are bought from CBSL's foreign reserves after paying the CBSL in rupees. This is done to prevent further weakening of the rupee if the required dollars are bought from the foreign exchange (FX) market, instead. But the flip side is that other than depleting the country's international reserves and increasing the island's rupee debt burden, it will also cause upward pressure on local interest rates due to the required excess liquidity required for such a purpose being bought from the money market to pay off CBSL for the dollars purchased. In the meantime, the money market was short for the thirty fifth consecutive market day yesterday, triggered by the twin combination of CBSL's protection of the rupee both in the FX market and due to the aforesaid mechanisms involved in the treatment of GoSL's foreign debt servicing commitments.